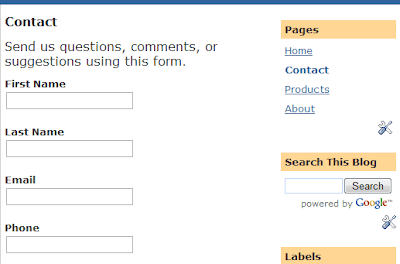 In this Blogger tutorial, we will look at Blogger static pages features in blogger. Blogger pages is best feature released by blogger.com recently. It lets you create Static Pages where you can publish information which never changes or less frequently.These are the stand alone pages linked from your blog. Blogger Static Pages are used to create Static Pages such as 'About Me',' Contact Us ',' Our Team' and 'Products' where you provide specific information according to the page title. Contact Us: Contact Us contains address , email Id and map to your location. You can create or add up to 10 stand-alone pages such as an "About Me" page.And you have opportunity to add, edit , delete and view Static Pages. From the above image you can observer that edit, delete and view. After the creation of static pages you can edit, delete and view. That's all about the Blogger Static Pages.